I was a mess, my studio a crash site, gesso coating my hands, and paint all over me, I hadn’t realised quite how much I like to physically get down and dirty with the materials, because I love smearing and rubbing in with my fingers. My studio is trashed, not an inch of space to put anything anywhere. 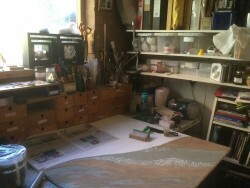 I start a piece of work with a reasonably tidy space, and then just go hell for leather, and because I use such a variety of stuff, materials, implements brushes etc, very quickly I have organised chaos. I have three panels in progress at the moment, all at various stages, so that when I am waiting for drying and setting time I can work on another piece, it also allows me to stand back from work to view with fresh eyes. Well, on reflection, there is no room to stand back!